Well first of all I am very thankful that the 1000 Thanksgiving cards are DONE and out of the house. 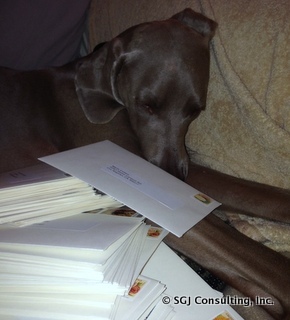 Licking all those envelopes was a bit much, even for my oversized lips, and I fell asleep half way through as you can see. More importantly, I can have the parentals all to myself again, since it was crazy with all of those cards…EVERYWHERE! The weather has gotten really cold, even for Southern California, so I am thankful for my warm blankets since I have no hair, and for Mom and Dad’s patience at night with getting up and covering me when the covers come off. Yes I know I am very spoiled! I am thankful for the opportunity to stop on my walks and meet complete strangers young and old. I feel it is important to give joy to everyone we meet. I am grateful for friends and the people who take care of me. If it was not for them I would drive my father even crazier then I already do. I am grateful for my family members, as my pack of peoples who love me unconditionally. And finally, I am thankful Turkey day is fast approaching, as I will get some I am sure and then I will be THANKFUL for Christmas, as I know my stocking will be filled with TREATS, and the new toys I deserve. Happy Thanksgiving Perry, Susan, and Jeffery!!! We love you Perry! Sending virtual hugs and kisses! Happy Thanksgiving to Pilgrim Perry and his Peeps!